Unlike other numerical analysis tools which depend upon computer computation, the reactance chart created by hand has the advantage in that the user is creating asymptotic plots which lend intuitive understanding to the circuit under consideration. Pole and zero locations, and the effects of component values are easily seen. In contrast, when using computer created Bode plots, the poles and zero locations are often not easily seen. Inductive reactance and capacitive reactance are read on the same scale as resistance. Reactance charts can also come with additional scales. One of the most useful for power supply design is an additional y-axis scale for gain which can be shown in decibel and non-decibels. When drawing the combination reactance of two elements in series, just use the higher impedance as an approximation. Conversely, when drawing the combination impedance of two elements in parallel, just use the lower impedance as an approximation. Since the load resistor is in parallel with the capacitor, the load resistor will dominate the output impedance at low frequencies. Put a mark on the left axis of the reactance chart corresponding to 5 ohms. 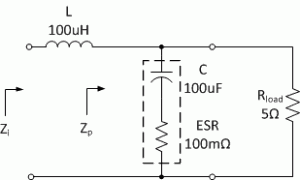 The ESR of the capacitor will dominate the output impedance at high frequencies. Put a mark on the right axis at 100 milliohms. In the mid frequency range, the impedance is dominated by the capacitor. Draw a diagonal line along 100uF beginning at 5 ohms and ending at 100 milliohms. Complete the horizontal lines representing the load resistance and the ESR. Label the different parts of the plot to show which component is dominating each part. First put a mark for 100uH at the high frequency end of the chart to represent the inductive reactance. Note that the inductor is in series with the parallel impedance of the output capacitor and load resistance, Zp, so we select the higher of the two impedances as the input impedance. Therefore draw a segmented line along the asymptotes of parallel impedance of the capacitor and load resistor, Zp, at low frequencies up to where the inductive reactance plot would intersect with the plot of parallel combination of capacitor impedance and load resistance, Zp. At higher frequencies, as determined by the point at which the two plots intersect, the input impedance is dominated by the inductor. Therefore draw the plot so that it follows the inductive reactance plot. My solution for Zi is shown in green. Note that the frequency at which the inductive reactance asymptote intersects with the parallel impedance of the output capacitor and load resistance, Zp, is a resonant frequency since the inductive reactance and capacitive reactance are equal in magnitude but opposite in sign resulting in impedance cancellation. To get the transfer function, we graphically divide the parallel impedance of the output capacitor and load resistance, Zp, by the input impedance, Zi. Plot the result for the entire curve. My solution for the transfer function is shown in red. Asymptote wise, the result is a gain of one (unity gain) up to the resonant frequency of 1.59kHz. At the resonant frequency, there is a resonant double pole, and the transfer function begins a rolloff at a -2 slope (-40dB per decade). At 15.9kHz, the slope changes to -1 (-20dB per decade) due to the zero created by the ESR and the capacitance. At the resonant frequency, I prefer to illustrate the resonance as a simple impulse with magnitude equal to the Q-factor. The resonance Q-factor can be determined by dividing the characteristic impedance (the impedance in ohms at the resonant frequency of either the inductor or the capacitor) by the ESR. The ESR limits the resonance in this case. It is found that the Q-factor is 10 (20dB). After plotting the gain, we should be able to see graphically where breakpoints are. I prefer to circle them to make them stand out clearly. By inspecting the impedance plots used to generate the gain plot, we should be able to see which components are controlling the gain plot characteristics. The following graphic is my solution for this exercise: Reactance Chart, LC Low Pass Filter Transfer Function This is the end of this tutorial about reactance charts.